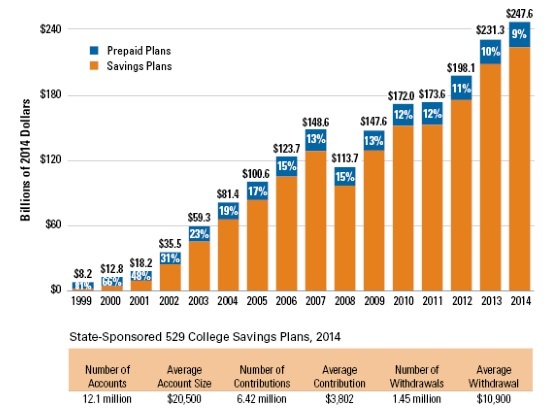 Prepaid 529 plans have been steadily declining in popularity while traditional 529 college savings vehicles have continued to gather assets. Conventional 529 college savings plans are popular for good reason--they offer a lot of advantages and flexibility for college savers. You invest aftertax dollars in a plan, usually age-based, which provides a diversified investment allocation. The investment mix gradually reallocates, too, reducing equities in favor of fixed income as the beneficiary ages. You are not taxed on the money as it grows in the account, and when you withdraw your money, the capital gains are not taxed either, provided you use the money for a qualified educational expense. Some states also offer a tax break on contributions. But while the tax advantages of 529 plans are certainly helpful, they won't get you all the way. The overall amount you save and the investment returns that you earn are also critical inputs. What if college inflation runs higher than you anticipate, and your 529 balance falls short come matriculation day? Or what if you did save enough, but a market downturn like in 2008 wipes out a significant portion of your account balance? Prepaid 529s attempt to hedge some of those risks. You pay for future college credits today, so you don't have to worry that the market might takes a dive between now and when your child starts school. You have assurance that your outlay will at least keep up with college tuition inflation, regardless of how much college costs skyrocket. So essentially, you eliminate market risk and inflation risk. Further, prepaid 529 plans also have similar tax benefits as conventional 529 plans. Qualified distributions are exempt from federal income taxes and might also be exempt from state and local taxes. And many states also offer tax breaks on contributions. Sounds pretty good, doesn't it? But unfortunately, in most cases prepaid tuition plans are better in theory than in reality. Prepaid plans lack flexibility and have many stipulations--a major reason behind their waning popularity. According to data from Savingforcollege.com, of the 20 or so prepaid 529 plans out there, only 10 are still open to new enrollment. And though they can make sense for certain college savers in very specific circumstances, most investors would fare better with a conventional 529. Read the fine print before you enroll. One big problem with prepaid tuition plans is that they hem you in. The way many states' prepaid plans work is this: If you buy a tuition credit today, you can only redeem it at full value at a participating in-state public school. If the student decides to attend a private school or an out-of-state public school, the plans will give you a refund, but some will only give you an amount based on average tuition levels at the state public institutions. Others will only give you the original contribution plus or minus some small amount of interest, such as 2% or 3%, in which case you likely would have done better saving in a conventional 529 savings plan, which allow you to use the funds at virtually any accredited college or university. Do the math before you sign on. Though the conventional understanding is that prepaid plans offer "future tuition at today's prices," some plans actually charge more than the equivalent of today's tuition. Prospective buyers should also pay attention to onetime enrollment fees and ongoing charges associated with the plan. In addition, though the funds in conventional 529s can be used to pay for room and board, funds in most prepaid plans will only cover tuition and mandatory fees. (Some plans allow you to purchase a room and board option, however, or use excess tuition credits for other qualified expenses.) Make sure you factor the cost of room and board expenses into your plan if you will have to self-fund them. A large portion of the total assets in prepaid 529s is made up of the Florida Prepaid College Plan, which continues to be a popular option with Sunshine State college savers. As prepaid tuition plans go, it isn't bad. It's one of the less-risky options, as its backed by the full faith and credit of the state. (Florida's credit rating per Fitch is AAA and per Moody's is Aa1.) Further, according to Savingforcollege.com, in the event the program is terminated, all participants within five years of college enrollment will receive full promised benefits while others will receive a refund of payments made plus interest. If the student decides to attend a nonparticipating college or university, benefits are paid out at the current rates paid to public universities in Florida. There’s also the Private College 529 Plan, which began operation in 2003. You buy "tuition certificates" from the plan, which is not state-sponsored but rather is owned by nearly 300 participating private colleges. Because colleges' tuition rates vary and also increase at different rates, the certificates you buy are based on the current price ratio. For example, if you buy a $10,000 certificate today it may be worth 0.33 years of tuition at one school where current tuition is $30,000, and 0.25 years at another school where current tuition is $40,000, according to the Private College 529 Plan website. Some states' prepaid plans are clearly not attractive options. Take the cautionary tale of Illinois, a state besieged by budget woes. According to a recent story in Crain's Chicago Business, the investment fund supporting Illinois' prepaid tuition plan, College Illinois, is on a path to insolvency. The fund relies on sales of new contracts to stay afloat, and sales have been dismal in recent years. That is compounded by the fact that state universities aren't receiving money from the financially strapped state, so they've had to raise tuition prices. And according to this Crain's article, the state of Illinois has no obligation to fill any shortfall between College Illinois investment returns and tuition costs. So students and families who thought they were purchasing guaranteed tuition actually had no guarantee that state institutions would honor the contracts come college time. Also exacerbating Illinois residents' lack of confidence in the plan is the fact that, as opposed to some states, the plan's prepaid tuition contracts are not backed by the full faith and credit of the state. Not that it would be especially reassuring if it was, as Illinois' debt teeters on the verge of a junk rating. A prepaid 529 plan could turn out to be the best choice for a student who is very likely to attend one of the participating schools, provided the prepaid plan offers good value for money as well as reasonable guarantees of safety and reliability. But for most college savers, a conventional 529 college savings plan is better option, as prepaid plans lack flexibility and offer inferior financial benefits.